Silverton High School Head Football Coach John Mannion is feeling pretty good these days about the decision – his family’s decision, he said – to pack up and move to Oregon from their home in Pleasanton, Calif., in 2010. Pleasanton, a city of 70,000 in the Bay Area, prides itself on its small town feel. Silverton, on the other hand, is an actual small town. Mannion’s football team has 8-2 record as of Nov. 9 and finished second in the Mid-Willamette Conference. As of deadline, the score wasn’t available for the Nov. 11 state playoff game against Ashland High School. 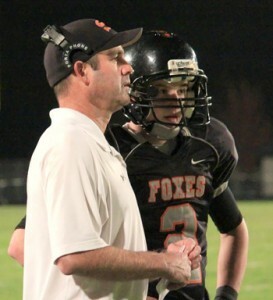 He gets to see his 19-year-old son Sean play at Oregon State University most Saturday afternoons. His children are enjoying their new hometown. But Mannion admits moving to Silverton last year was a very difficult decision for the family. From 1996-2009 Mannion coached football at Foothill High School in Pleasanton, working mostly as an assistant but also serving as head coach and co-head coach in his last three years there. During Mannion’s tenure at Foothill, the team won eight league championships, and he also served a stint as the school’s athletic director. Leaving the school was not easy. Mannion says adjusting to Silverton has been easier because of the way his children have dealt with it. Mannion and his wife, Inga, have three children at home: Katie is a senior at Silverton High; Megan attends Mark Twain School after spending last year at Silver Crest; and Brian is a second-grader at Eugene Field School, where Inga Mannion teaches. Sean Mannion, perhaps the most famous member of the family, is just an hour away in Corvallis, where he is the starting quarterback for the Oregon State Beavers. It has been a memorable fall for the Mannions, all things considered. John’s Silverton team has had an outstanding season, winning a number of close league games. Three-sport athlete Katie and the SHS volleyball team had a successful season in the tough Mid-Willamette Conference. Getting to see Sean play home games has been a treat for the family, as well. Despite the Beavers’ struggles this season, Sean Mannion, a redshirt freshman, has impressed most observers with his physical talent, intelligence, leadership, and his calm demeanor and poise on the field. However, you won’t find the close-knit Mannion family publicly leading the cheers for Sean, or joining in the ongoing analysis of his performance on the football field. As a veteran football coach, Mannion is all too familiar with the scrutiny that his son is under, and how fine a line it is between being celebrated and being excoriated. “It is what it is – we’re excited for him and very proud of him but we’re also anxious about the attention that goes with it… It’s exciting but also nerve-wracking. I’m a ball of nerves when I go to a game down there. I do enjoy it, though,” John Mannion said. Asked what he meant by that, Mannion said, “Katie is a great kid and has a lot of initiative. She looks for a job and does it. You never have to wake her up for school, you never have to remind her, you never have to think twice about what she should be doing. Then there is his own team to be proud of, as well. After a 2-7 season in 2010, when the team suffered a number of heart-wrenching losses, the Foxes have turned it around in 2011, winning those close games in a tough league. Mannion is having a good time with this group. “The players (on my team) are a great bunch of guys,” Mannion said. “I love going to practice with these guys. They’re fun, they work hard, they’re very coachable. Some coaches like the games. I enjoy the games, too, but I enjoy the practices even more. “These guys are dialed in and they go about their business. We’ve won a lot of close games. I really believe that close games come down to doing a lot of little things right. I think these guys really do that as far as hustling and supporting one another and being positive. While Mannion says he and his wife are “still acclimating” to Silverton, he appreciates all the people who have reached out to his family in the last year. Asked what he is thankful for, Mannion finds plenty of things on his list. “I’m thankful for a great family. I’m thankful for very supportive and dear friends. I’m thankful for good health. I’m thankful for the opportunity to work with young people every day, on and off the field, and to be a good role model to help them to better things in the future,” he said.